doTERRA is a relatively new MLM company that mainly focuses on selling essential oils. It was founded in 2008. It’s has been in the business for 10 years now. It looks like the number of MLM companies is growing but majority of them are not so great in terms of opportunity for people to make money. I did some research about doTERRA essential oils and found some interesting facts that I want to share with some of you. Because I know some people are still doing their research to find out what is doTERRA. If you want to know: Is doTERRA a scam? my short answer is “NO”. It’s not a scam. It has both good and bad points and I will try to show you all of them so you can see the whole picture. doTERRA is based in Utah, USA and was founded in 2008. It has various products, such as essential oils, laundry detergent, hand wash products, respiratory drops, skincare, body and hair care products, weight loss products, oil diffusers and more. You can earn some money here and I will discuss it further within my review. As I said, doTERRA has a wide range of products, such as essential oils, personal care products, weight loss, accessories, such as key chain, child resistant caps, mouse pad, diffusers, bamboo box double drawer, amber roller bottles, doTERRA orifice remover, FCO bottle pump, pipettes, sprayer, children’s supplements, digestive health capsules, vitamins, doTERRA baby collection pack. So, the product line is really impressive. You have a choice to choose from, to buy for your personal use or sell to others. doTERRA provides training and some resources for doTERRA members. – Discover Solutions has some training materials that you can use to help people understand which essential oil will work for them. – Empowered Life is a monthly webinar designed to educate you in the field of essential oils. If you plan to join doTERRA you can learn some useful tips to apply in your business. You can also download some PDF and PowerPoint files, join doTERRA Facebook group, go through social media course. 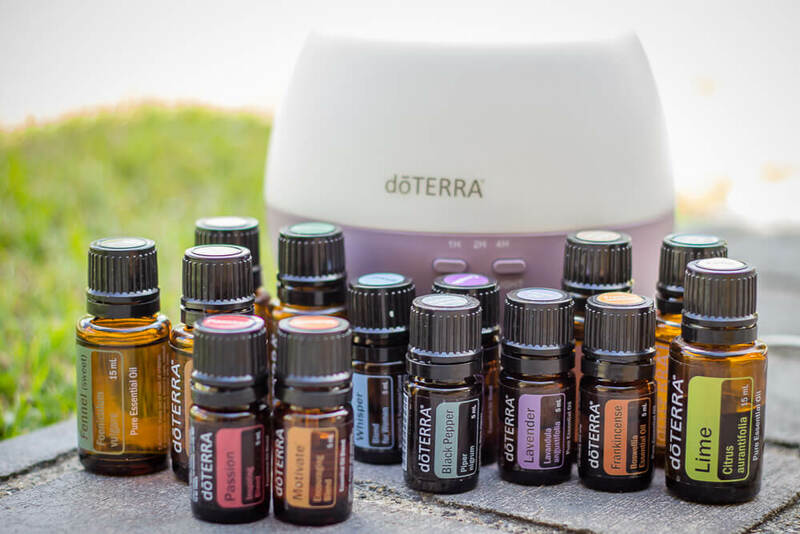 doTERRA also offers Resources page where you can find literature, Klass kits, eBooks, Flyers, Images, Presentations, Videos and more. There are several competitors to doTERRA, such as Young Living, Now Foods, Shaklee, Amway, Melaleuca, Nu Skin, Plant Therapy, Aura Cacia, Edens Garden. With this kind of competition your job as a doTERRA distributor will not be easy. Because doTERRA prices are not cheap. You will have to educate yourself in the field of essential oils so you can explain to people why they should buy doTERRA products instead of let’s say products from Now Foods or Young Living. 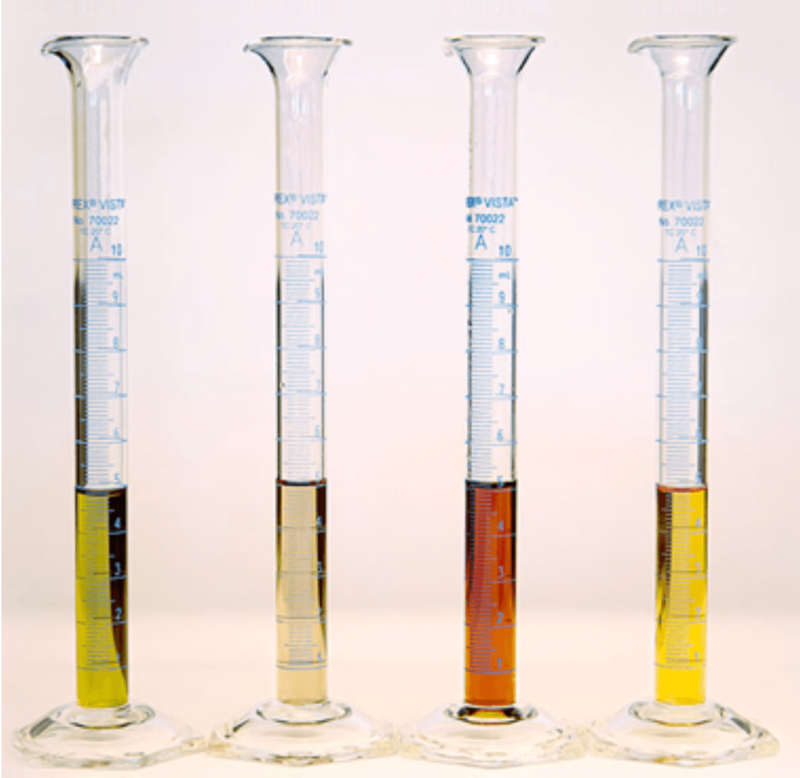 According to the information taken from doTERRA website, doTERRA products are CPTG Certified, i.e. Certified Pure Therapeutic Grade. For more information about this test you can learn here. I’m not an expert in this field and can’t say if this Certificate does really prove the quality of doTERRA products. I have no such a knowledge to give such verdicts. More on this read below under the title “What I don’t like about doTERRA”. First thing that I don’t like about doTERRA is regarding its CPTG ( Certified Pure Therapeutic Grade). I did some research and found some interesting facts that I believe will interest you too. doTERRA claims their certificate is from FDA, i.e. their products have therapeutic grade. The truth is that doTERRA registered its trademark and paid money for it. It doesn’t mean that FDA (Food and Drug Administration of the USA) gave doTERRA that certificate. Officially doTERRA admits that their products have certification from US Patent and Trademark Office. This Office is not a laboratory that gives quality certificates. It’s not about quality rather than about business trademark. This means doTERRA tries to convince people that their products have therapeutic quality while it’s not true. 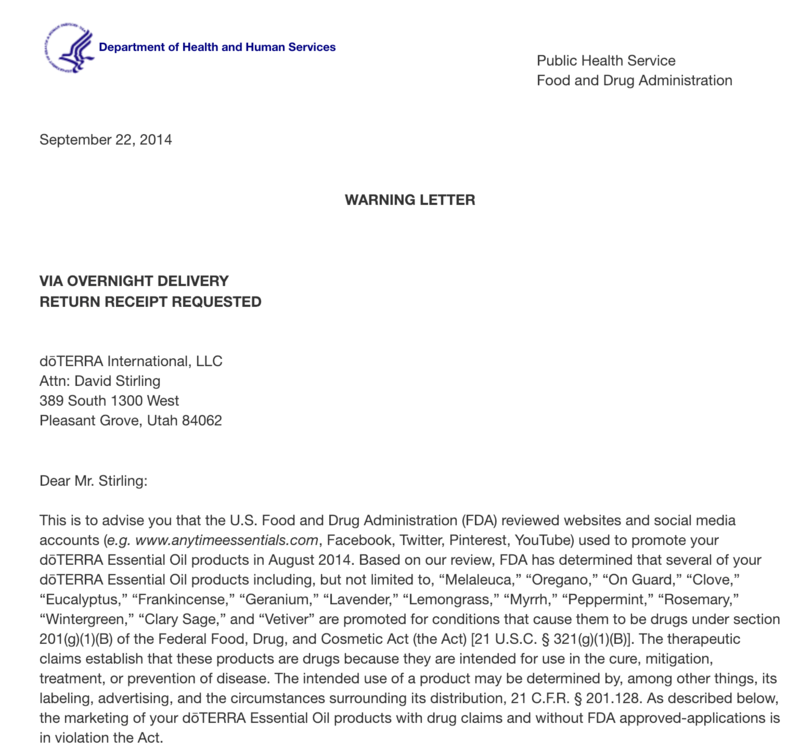 You can even read a short paragraph from a warning letter from FDA to doTERRA. There is some food for thought here. BTW, FTC (Federal Trade Commission) says that companies that make health claims must provide solid proof. Prices of doTERRA are not cheap though they are not most expensive. For example, you can Lavender oil from Young Living for $32 per 15 ml bottle and for $23 from doTERRA per 15 ml bottle. And you can buy the same product from Now Oils for $4 or for $11 from Edens Garden. See the difference? I think it’s huge. For more info read this post. I show you the difference so you can see for yourself and decide to join doTERRA or not. I mean competition is very tough. You really need to try hard to convince people to buy from you if you decide to promote doTERRA products. I personally think promoting Now Oils or Edens Garden products will be much easier because prices are affordable. 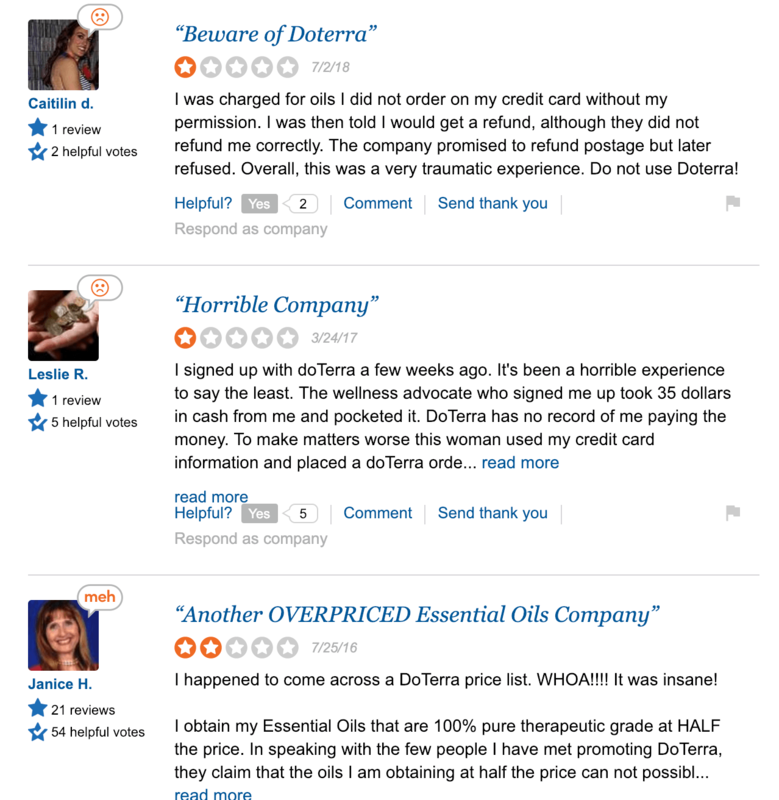 There are really many negative reviews of doTERRA on the internet. 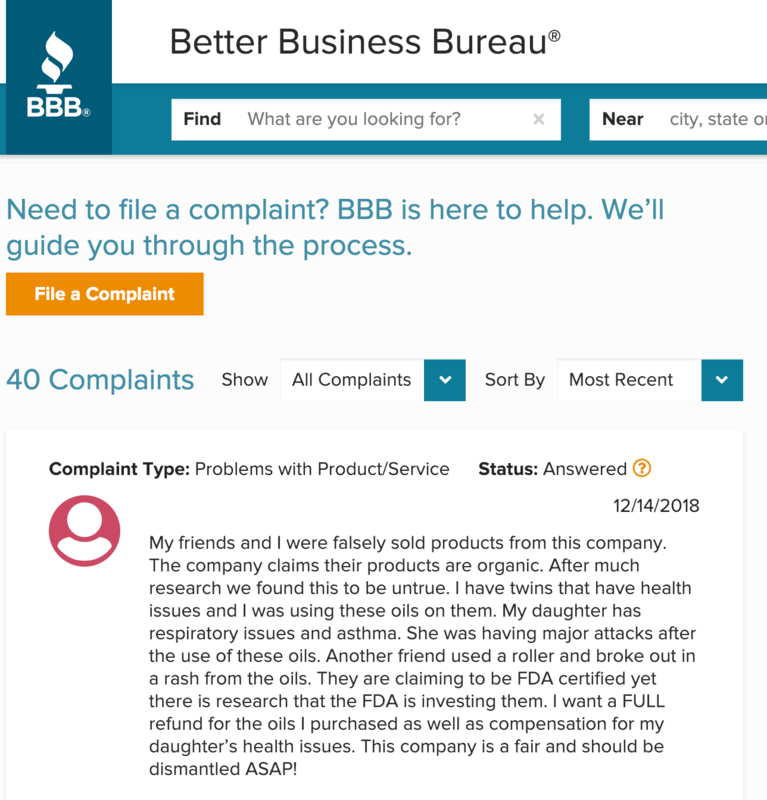 Some complaints are from bloggers, some complaints from users of doTERRA products. There are positive reviews too. See them below. 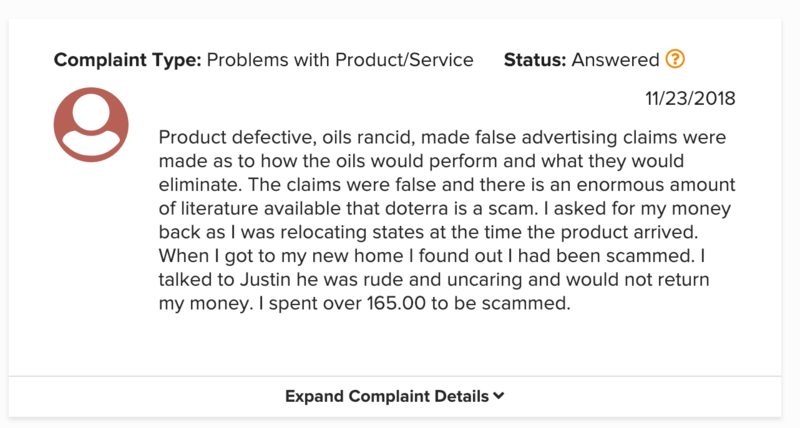 For example, one of the regular users of doTERRA, Julie say he found a better company that delivers the same quality and their prices are way better than those from doTERRA. This proves again that doTERRA and Young Living prices are very high. You can buy similar products from other companies mentioned above and save your hard earned money. The last thing that I don’t like about doTERRA is that income potential is low with the company. There are some things that I like about doTERRA. First, the company has been in the business for over 10 years and they still have their share of the market. Generally speaking doTERRA is a legit company and has a a wide range of products you can choose from. They have good support and help you get started with your business. They have training material and give you tools required for your MLM career. 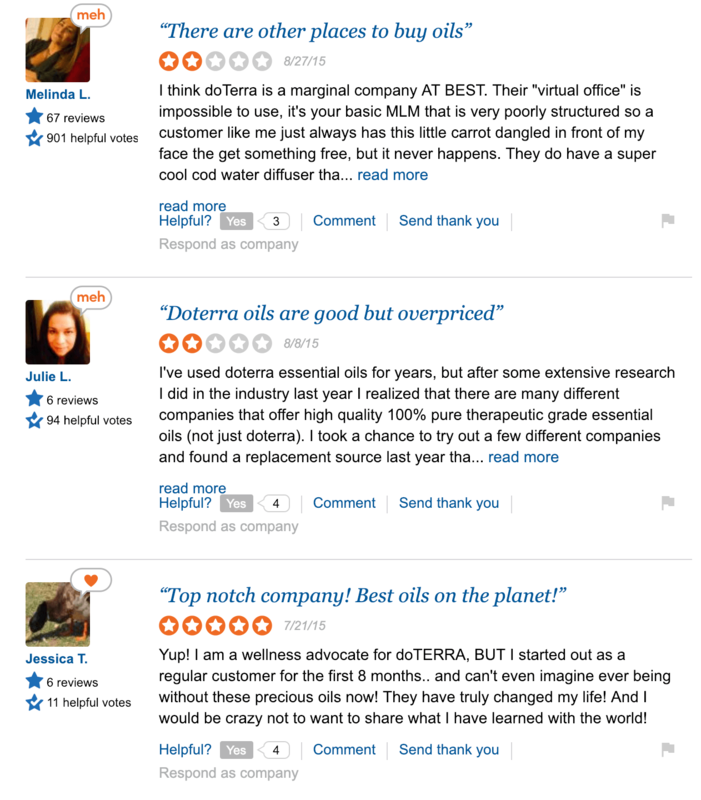 Though there are many negative reviews of doTERRA due to using misleading product certification strategy some people are happy with the quality of doTERRA products. I found a story on the internet about someone who had blood disorder and got cured thanks to using doTERRA’s Frankincense. It’s good to know that doTERRA products helped that person. But it doesn’t mean it can help other people too. As I know, there is no scientific proof that essential oils can cure you from serious diseases like cancer. Again, here we come to the same warning that gave FTC regarding exaggerated health claims. We have to be very careful making such claims. 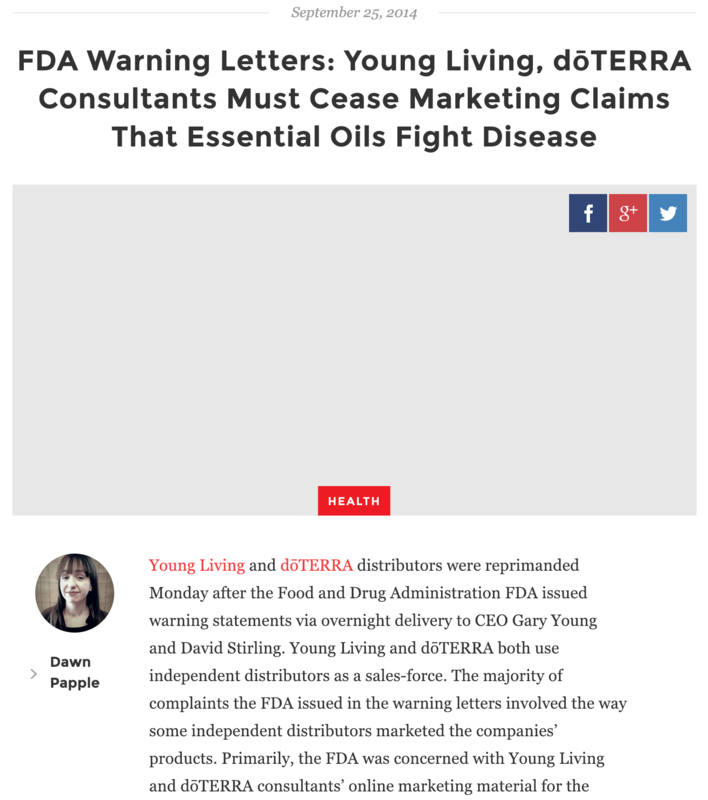 Here is I found another warning letter from FDA addressed to Young Living and doTERRA. Like with many other MLMs that I’ve seen so far doTERRA compensation plan looks good on paper but very hard achievable in real life. You can see income statement from doTERRA below. According to it they have different levels, ranks. The first sustainable rank starts from Silver level which can earn you $27,557 annually. But the main problem here is that before you reach that level you need to pass other levels, such as Wellness Advocate, Manager, Director, Executive, Elite and Premier. These 6 levels earn you very little income. I did some research and immediately found many complaints about doTERRA. Complaints are different. 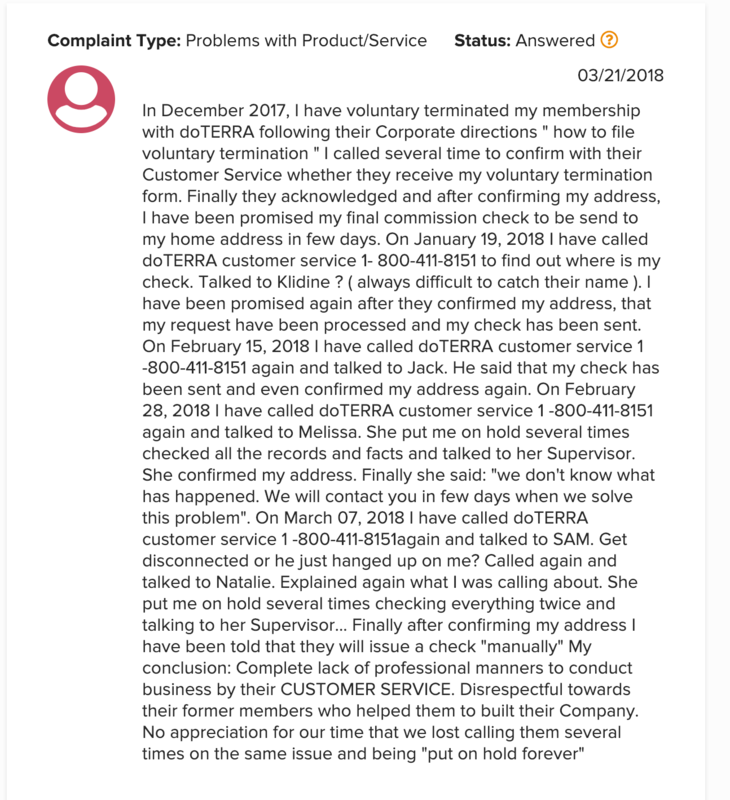 Some people complain about the quality of doTERRA products, customer service, problems with service, advertising issues, sales issues and more other reasons. You can learn more details by clicking on the link above. Can you become successful with doTERRA? Like with any other MLM you can not only buy doTERRA products for your personal use. You can sell them if you can do it. The question is: can you sell? Of course, anything can be sold even overpriced products. But it will not be easy to sell essential oils for $23 when there are other alternative products can be bought for $12 or even less and the quality is almost the same. Plus you need to pay $35 to activate your membership to doTERRA. Also, you need to spend $100 per month to be able to earn commissions from doTERRA. Most MLM companies require from you either meet their monthly minimum sales quota or spend a certain amount of money per month and buy their products. Buying is ok. The main thing here is to be able to sell those products before you spend another $100. If you have a lot of friends you can sell to then this business is for you. Otherwise it will be a big struggle for you. doTERRA also can help you with your promotions but generally speaking I don’t know how it will work for you. If you are not a sales person like me then you better look for some other programs without minimum sales quotas or minimum monthly spending. This can be achieved with affiliate marketing which is my favorite method to earn my income online. You are free to promote what you want and work part time when you have your free time. Another way to make money with doTERRA is inviting people to join doTERRA under your team. This requires from you certain skills and knowledge to find those people interested in joining you and making money. Your success depends on whether you can invite a lot of people or not and their success depends on whether you can help them do the same. Generally speaking, there is a tough competition when it comes to doTERRA and you need to learn new skills. 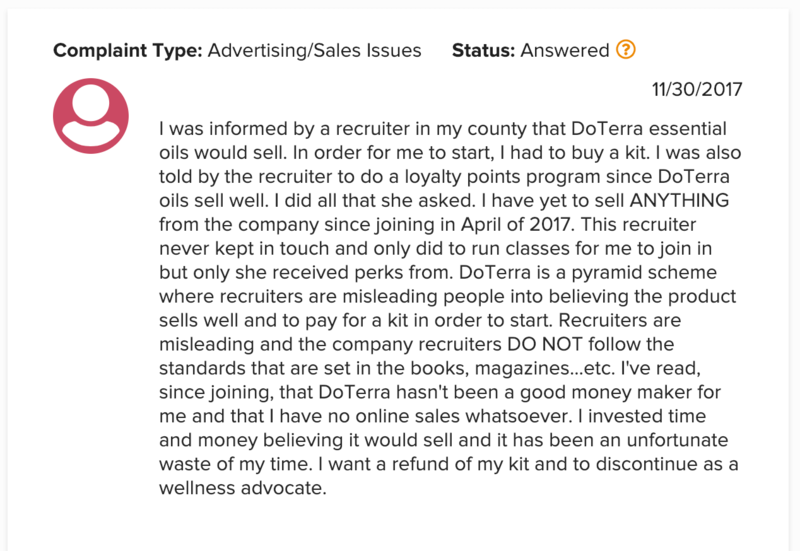 After reading my doTERRA review and learning some interesting facts can we have a question that we need to answer: Is doTERRA a Scam? Even after many complaints and negative reviews that we found on the internet? No, I don’t think it’s a scam. They have products and have been in the business since 2008. Some of their health claims are misleading and they had warning letters from FDA which is not so good for their reputation. But still you can make money with doTERRA. It will not be easy at all with all the competition that you will have to face. If you think you can make money with doTERRA it’s ok. But I believe affiliate marketing is much better because you are not limited to doTERRA products. You can promote anything without any minimum quotas or minimum monthly spending. It’s up to you to decide which of these two opportunities is better for you. My personal recommendation is affiliate marketing. You can start with this program. It’s free to start. If you have questions I will be happy to answer them. The doTerra MLM company sounds very similar to another company that I was personally involved with doe 2 months. It sold health care, skin care, and beauty products using lots of innovative technology to create products that really worked well. My experience was not good. 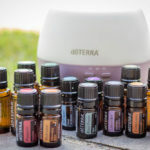 As with doTerra, their MLM company business setup meant that these products were expensive, in some cases not cleared for use in some countries, and there was a buy-in plus a monthly minimum spend for all the people who wanted to sell their products. That amount was even higher than doTerra ($150 a month!). There was a lot of hype and of course the top levels of the company to include the owners traveled the world sucking in more people to sign up as affiliates or representatives. I attended one ‘seminar’ and quickly saw that it was very much a hyped up show with little substance. The main push was to sign up new people. Even though the products were good, the focus was to get MORE people to pay that $150 minimum a month. This means that sell externally or not, the company was going to have a good number of sales of the overpriced product. I quickly saw that the potential was not very good, and when I did additional research into the company after the second month, noted that the chances were not good unless I was willing to lose friends and even family by pushing them to buy the stuff from the MLM company. A hard sell indeed. For this reason, I agree that unlike some MLMs that you find out there, even those that have legitimate products they are selling are limited in potential just due to pricing. Add in the minimum spend, and depending on how far down the chain of affiliates you are, you really are supporting those at the top. Much better and providing more likelihood of success is the platform you also added within this review. The Wealthy Affiliate platform is where you can learn to promote and sell online successfully, and indeed you can promote the platform as well and make money. There is a membership cost, but compare that to what you get, and you will quickly see that the investment makes sense over having a bunch of essential oils in your cupboard. You get so many features and top-notch training. It is a no brainer for me, and remember, I have done both MLM and the Wealthy Affiliate. The review you have put together is a very fair and valid one, and if anything, you lean towards a more positive position than I likely would. This is based on my own experiences with MLM, so I am not completely unbiased. I do not get involved with any pure MLM companies, as I do not believe they are a sustainable business model and feed on the affiliates that join later on after the start of the company. Thanks! This is one I will stay away from. Thank you for sharing your experience with MLMs. I hope some people will benefit from it though there will always be some who will not agree with our opinion. Regarding WA I agree with you. It requires monthly payment but it gives you way more than a bunch of oils from doTERRA. Anyway, everyone’s experience is different. For someone MLM is good while for others like you and me affiliate marketing is a real deal. Let everyone make their own decision. doTerra products look great, but I think the only reason that they are so pricey is that they are an MLM company, and they need to make money over and above the product production costs to pay their distributors and their downlines. There are many great oils and similar products available in your local health shop or even on Amazon for a quarter of the price. It is for this reason that I don’t do this kind of selling, as it is really difficult when there is so much competition out there for similar products. Thanks for a detailed and well-researched review. I am sure you will help many people to make up their minds about this opportunity. Yes, exactly. MLM prices are always high because it’s the only way to pay commissions to their members. With the kind of competition that we have on the market it’s better to choose affiliate marketing and competitive prices. I have to say I disagree with the 50 out 100 rating. Meaning, I have used their essential oils for several years. They are good quality products. There are a lot of similar brands in the industry that actually sell adulterated essential oils. doTERRA is not one of them!However, they do have really good training as a Wellness Advocate. I am actually a Wellness Advocate and have been for several years. A lot of people are turned off by the MLM business model. However, it actually pays pretty well. You don’t have to go door to door. Instead, you can develop a niche site and sell their products that way. It actually pays more than affiliate programs once you start to build a good downline.I believe they are much better than Young Living, though! I have heard they were founded by people that were unhappy with Young Living. Of course, it’s your right to disagree with me. It’s good to know that you have an extensive experience with MLMs and especially with doTERRA. I know that they pay very well which is possible because of their high prices. When it comes to selling doTERRA products through your niche site it’s good that doTERRA teaches this too. But it becomes even more difficult because of their prices. Because people can easily compare prices and turn off from doTERRA immediately. If you use niche site for promoting doTERRA then it’s better to do affiliate marketing instead of limiting yourself to doTERRA only. This was a pretty comprehensive review and you have brought to limelight some doubts I had about doTERRA. As you said, their program is not a scam but their outrageous claims can be misleading. Also, the fact that their products are pretty expensive begs the question why do I not just make my purchase from a different company with similar products that do the same thing. This would make marketing their products pretty difficult especially if the person you selling to knows about those other products. All in all, it is not a bad program but I would really think twice before I decide to patronize them. Yes, the price aspect is the most important here. Why should I pay more when there are other products available for a lower price. It doesn’t make sense in my opinion. I believe those who are interested in buying essential oils do their research and know about other competing companies. This will definitely make the advertising process much more difficult for doTERRA members. Instead of struggling with doTERRA products they can easily promote other products. Good review. Whilst not a scam, this is definitely not an opportunity that I would be interested in and I would deter others from it as well. The FDA ‘certification’ is misleading and deceptive and the reviews are awful. On top of that, the extortionate price of their products would make it a very hard sell. I don’t want to deter anyone from doTERRA because I leave it to their decision. I didn’t say doTERRA was bad or good. I just did my research and let my readers decide what to do. If someone feels MLM is a good method for them let them make their choice. Doterra products are a real product that you can buy and have in your hand, so I wouldn’t say it is a scam as such. It is a multi-level marketing scheme like Herbalife and Pruivet that work on you buying the product and recruiting others to sell the product for you and you make a commission and so on. Everybody thinks these things are pyramid schemes, but they are like most businesses only more extreme. In theory, they work well, but I find most people just make a little pocket money and the people at the top make most of the money. Do essential oils even work? Really, or is it in the mind of the user? I don’t really believe in this business, there sounds like too many negative aspects such as the FDA certificates and grade qualities of the product. You are right Kris. Many people think that MLMs are pyramid schemes but in fact not all of them are such. But the truth is that most of them work exactly as pyramid schemes and that’s why I always recommend affiliate marketing to my readers instead of MLM. I believe affiliate marketing is much easier and has more success stories than MLMs. From my experience, when a company has to resort to MLM and basically use brain washing techniques in the training the companies failure is imminent. I also see a very limited amount of product leaving a member with limited income potential. I personally prefer you Top Choice for making real money online. I agree that not all but most MLMs use brain washing. Because it’s the only way to convince people to buy overpriced products. I can’t agree with such approach and that’s why always recommend affiliate marketing. Though brain washing can be in affiliate marketing too. But at least, you are free to promote what you want and only earn your affiliate commissions from retail or wholesale prices.